An optometrist is a Doctor of Optometry, also known as an O.D. To be an optometrist, one must complete four years of college or undergraduate education followed by four years in a college of optometry. All optometrists must pass a series of rigorous nationally-administered exams to earn their license. Examine and diagnose eye diseases such as glaucoma, cataracts and retinal diseases. Diagnose systemic conditions that may affect the eyes, including diabetes and hypertension. Examine, diagnose and treat visual conditions such as nearsightedness, farsightedness, astigmatism and presbyopia. Prescribe contact lenses and glasses, vision therapy and medications such as antibiotics. Perform minor surgical procedures such as the removal of a foreign body. What is a Consultative Optometrist? There are many optometrists who seek additional training after receiving their doctorate to further specialize in areas such as low vision, pediatrics, medical optometry, or specialty contact lenses. At Anne Arundel Eye Center, we are fortunate to have two doctors of optometry, Nicole Regis O.D. and Kathryn Turner O.D., specially trained in diagnosis and treatment of medical ocular conditions. Dr. Nicole Regis completed a residency in ocular disease at Seidenberg Protzko Eye Associates in Maryland. Her work and training focused on glaucoma, refractive and cataract surgery management, neurologic eye disease, corneal disorders, retina and diabetic exams, nursing home care and emergency eye care. 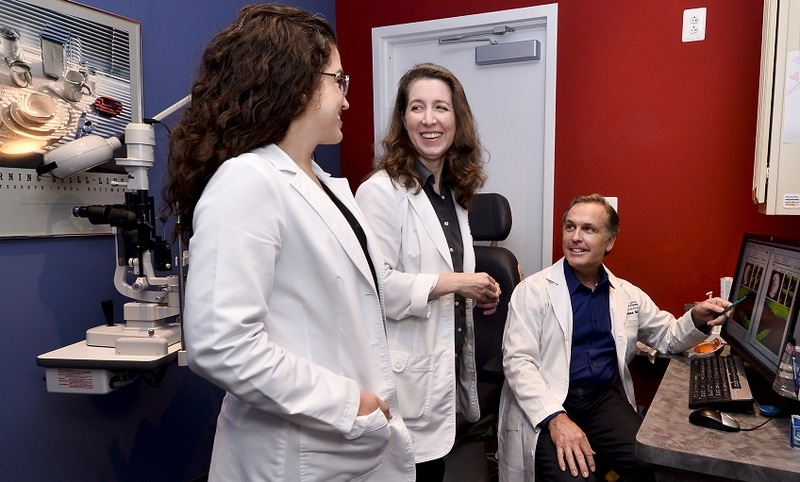 Prior to joining Anne Arundel Eye Center, she served as an adjunct faculty member for the New England College of Optometry to mentor and train students and resident doctors. She previously traveled to El Salvador to provide eye care to remote areas, and hopes to be involved in a similar endeavor in the future. Dr. Kathryn Turner received her Doctor of Optometry degree in 2008 from the Pennsylvania College of Optometry. She served as an optometrist in the US Army for four years and cared for soldiers with a wide range of ocular health conditions including ocular emergencies, ocular surface disease, glaucoma, diabetes, and refractive conditions. Since leaving the Army she has continued to care for and focus her training on a wide range of medical ocular issues with special emphasis on glaucoma, diabetes, ocular surface disease, neurological conditions, emergency eye care, and cataract and refractive surgery management. An ophthalmologist is a medical doctor (an M.D.) who specializes in the medical treatment of the eye and vision care. Ophthalmologists are trained to provide the full spectrum of eye care, from prescribing glasses to eye surgery. They may also be involved in medical research of the eye structure as well as diseases of the eye. After medical school, every ophthalmologist completes a three-year residency in general ophthalmology. During residency, they receive special training in all aspects of eye care, including prevention, diagnosis, medical and surgical treatment of eye conditions and diseases. Some ophthalmologists spend an additional year or two training in a specific area of eye care to become a specialist. Anne Arundel Eye Center was founded by board-certified ophthalmologist and Maryland top surgeon Dr. Samuel Boles who received his medical degree from the Medical College of Georgia and completed his post-doctoral training at Schepens Eye Research Institute, a Harvard University research lab, a Yale University affiliated Hospital in Bridgeport Connecticut, George Washington University for Ophthalmology Residency and the University of California, San Diego for Glaucoma Fellowship. Optometrists spend additional time and attention to contact lens fitting and care. Optometrists are uniquely positioned to fit and prescribe glasses and care for refractive disorders. Ophthalmologists are trained to perform surgery, including Lasik vision correction, removal of cataracts, retinal detachment surgery eye reconstructive surgery and more. Ophthalmologists have additional specialized training in diagnosing and treating more complex medical eye conditions. Ophthalmologists can prescribe a wider range of prescription drugs for specific eye problems and diseases unlike optometrists. Exams by Ophthalmologists are more likely to be covered by general medical insurance rather than Vision Insurance. The Anne Arundel Eye Center (AAEC) is a regional leader in the diagnosis and treatment of glaucoma and cataracts. We have a team approach to managing our patient’s ocular health with the help of our entire team and other physicians, based on the patient’s needs. Dr. Samuel Boles, Dr. Nicole Regis and Dr. Kathryn Turner collaborate on the treatment plans of each patient which means you always have access to care, even if the doctor you usually see is not available at your preferred appointment time. For patients who do not already have a primary eye care doctor for non-surgical needs such as glasses and contacts, Anne Arundel Eye Center can recommend them to a world-class doctor for those needs. Need eye care but not sure where to start? If you have any questions, please contact the eye care specialists here at AAEC by calling 410-224-2010. Staffed by caring and knowledgeable professionals, AAEC’s state-of-the-art treatment center is dedicated to making the best eye care accessible to everyone.